I know, I’m a rower, and you’re thinking “Really, you’re first book review for your blog is going to be about rowing!” No, actually, I’m going to review an amazing book that’s been on the NY Times bestseller list for over 25 weeks, most of the time in the top 5 in differing categories. It came out in hard cover in the Spring of 2013 and I downloaded it on my Kindle that summer after seeing a write up in Parade magazine. The book got all of this acclaim primarily through word of mouth. No big media blitz, just rowers and others sharing it with friends and family. As the subtitle conveys, it’s the story of “Nine Americans and their epic quest for gold at the 1936 Berlin Olympics.” I knew I’d probably like it due to the subject matter, but I had no idea how much I would LOVE it and learn from it. I’m not a huge history buff, but I learned so much from this book about what went on in Nazi Germany leading up to the 1936 Olympics…fascinating. One of the great things about the book is that it not only touches on the inhumanity of the Nazi’s, but it also teaches about perseverance and getting through life struggles in a positive way…with a little bit of physics thrown in too. Brown has such an incredible way of writing that his book keeps you captivated throughout. When I was done reading it, I went to my rowing team practice and told everyone, “We’re having a one-book, book club and everyone should read this book.” I was so excited for all of them to read what I had read. I’ve always been drawn to non-fiction, pull yourself up by the bootstraps, kind of books, but this is one of my all time favorites. There’s one part of the book where they are going to go to the Poughkeepsie regatta and as soon as I read it I was so excited!! My daughter went to college at the beautiful campus of Marist College on the Hudson in Poughkeepsie, NY. For parents weekend her sophomore year (2009) they decided to do a re-enactment of the Poughkeepsie Regatta. Well, at the time I was just looking forward to seeing rowing on the Hudson and their newly renovated Cornell boathouse (it’s gorgeous, by the way!). Little did I know at the time that I’d be reading about the importance of the original regatta four years later in this book. So cool! “Physiologists, in fact, have calculated that rowing a two-thousand-meter race – the Olympic standard – takes the same physiological toll as playing two basketball games back-to-back. And it exacts that toll in about six minutes.” Now, we masters rowers take a little longer to get down a 2K course, but isn’t that an amazing statistic. I mean, my team totally ROCKS!! The main character, Joe, says, “It takes energy to get angry. It eats you up inside. I can’t waste my energy like that and expect to get ahead.” …to that I say “AMEN! !” You have no idea how much I love that quote!! I’m not exaggerating that I have over 10 excerpts highlighted on my Kindle from this book…and that’s probably because I exercised some restraint in my highlighting and didn’t want to totally bore my book group. My book club read it this past July and, although skeptical at first, everyone thoroughly enjoyed it and agreed that it’s not just about rowing. It’s been called the nautical “Chariots of Fire” by Publisher’s Weekly and the Weinstein brothers are working on a script, directed by Kenneth Branagh, for an upcoming movie. 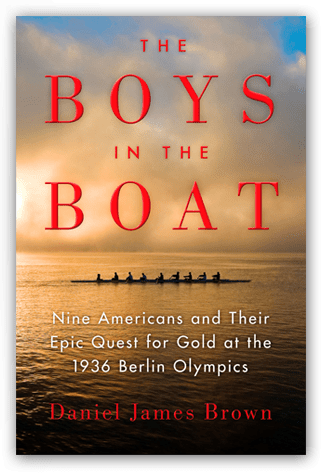 Good blog topic…The book is amazing and it is amazing how many people I have run into not associated with rowing that ask me if I have ever read “Boys in the Boat.” You don’t have to be a rower to be inspired and moved by what this group of young men accomplished!! I absolutely loved this book, even knowing nothing about rowing. My boyfriend read it too, and we’re hoping to go see a crew race sometime next spring now! Maybe we should go to Marist! Yes,Christine, you should go!..it’s a beautiful train ride along the Hudson…& some cute stops along the way. Glad you enjoyed the book too!! I keep buying more copies of Boys in the Boat to give away. I love this book and everyone I have given it to makes a point to tell me just how much they loved it too. 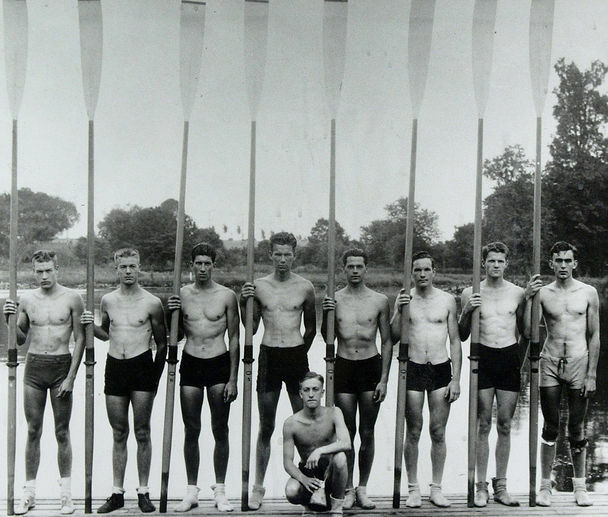 For some it is there first exposure to rowing and now they have a glimmer into why I love rowing so much. Hallelujah we live in California! Hi Jeanine, I have not read the book but read something every night before bed. I’ll have to read it next. My brother rowed while in college and actually took a year off after to try out for the olympics. Unfortuantely, they didn’t qualify. I loved watching him even though you really didn’t get to see them until the end of the race. It sounds terrific – wonder if it’s available on this side of the pond? I read ‘Unbroken’ last year, which is also a true story about endurance & spirit, and I’ve bought several copies to give away just like the previous reply! Enjoyed your blog very much Jeanine – will be back for more! Hey Gina…I would imagine it’s available over there..and yes, in the same vein as Unbroken. You’d love it! I’m really impressed with your writing abilities and also with the structure on your blog. Is this a paid subject or did you modify it yourself? Either way keep up the excellent quality writing, it is uncommon to see a nice blog like this one today..
I’ve been holding out on reading this post until I finished the book, and I did last night! And all I can say is WOW! I remember when Christine told me she and David were reading it… And then you mentioned you read it… So I finally caved. But I’m totally happy I did! What a fantastic read! I love love loved the story! I was hooked from the get go. I am such a fiction reader, and always streer clear of non-fiction because I assume they’re going to be slightly boring accounts of people or stuff that happened and I learned about in 7th grade. But this, this story was amazing!! And made me totally miss competing in team sports: the bond, comraderie and shared commitment is so unique and is so eloquently summed up in this book! Thanks for the rec!